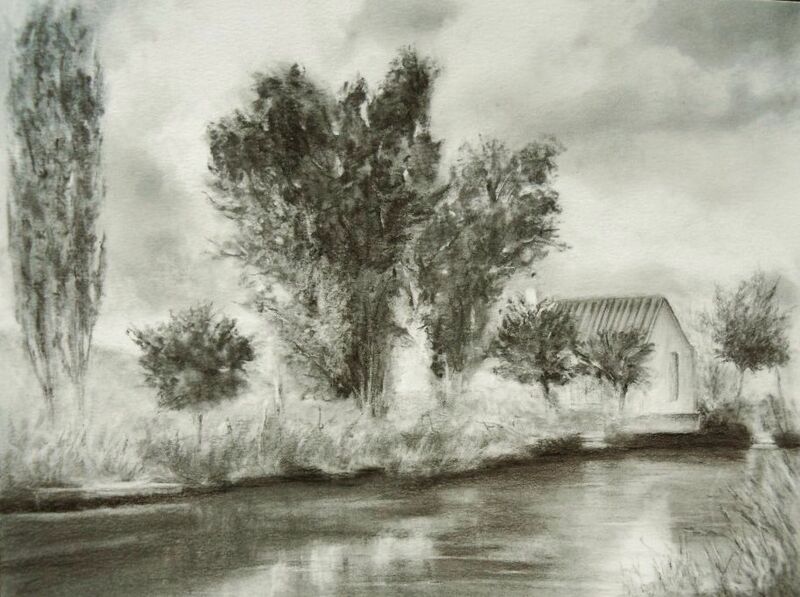 River Hideaway, a charcoal and graphite drawing (9×12) was created on Strathmore Bristol Vellum. Nearly the entire scene was done in charcoal with the exception of the river, there graphite was used for its reflective qualities. Charcoal was the choice medium giving the land depth and an overall softness to the atmosphere. This Spanish scene was photographed by a pmp photographer and artist Juan Sandin. The first time I saw the image I immediately thought of Ernest Hemingway – I could see him writing one of his powerful novels tucked-away in this quiet place. This entry was posted in Drawings and tagged art, charcoal, drawing, fine art, graphite, grass, house, landscape, river, sky, trees, weeds. Bookmark the permalink. Such a special comment Ana, thank you so much ~ it means a lot. This was a unique scene to try and capture in B&W, so glad you enjoyed it. Thank you also for your generous compliment – hope you have a wonderful week ahead. Thank you for your kind words ~ much appreciated! Your beautiful drawing also gives viewers a wonderful space to imagine… That is what a beautiful paintings and drawings do. Love your response Amy to this drawing – thank you for taking the time to visit and comment. We certainly do become absorbed in the moment when seeing a slow-moving river – and in seeing this beautiful drawing, too. A person could hang out on the banks of that river all day. Thanks so much Ruth, I agree ~ lounging with nothing to do except love being right there. Thank you Bo for re-posting, means a lot! Thank you so much Jo! I wish you also a wonderful and happy Easter my friend. Thank you Maniparna for your thoughts on this drawing, really appreciate it! I agree with Susan above. Your drawing inspires peaceful, relaxing feelings. Hi Hien, thank you so much for your kind and gracious comment. I really appreciate your thoughtfulness. Your charcoals are brilliant, my dear friend, just brilliant! Hope you’re having a lovely Sunday. Beautiful Mary! There’s something mystical about your rendering. I sense the peace and quiet. Love it! Hi Catherine, thank you so much – very cool to read your reaction. Glad you enjoyed the drawing. Thank you so much Cynthia for your response – I really appreciate it! Sweet and inviting, and it also gave me a bit of a chuckle.. Casa Loca is about that close to the river right now – at least at high tide! 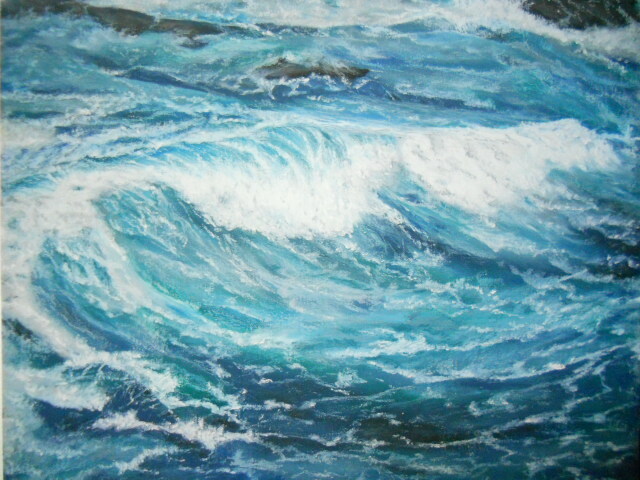 In the rainy season, that doesn’t allow a lot of comfortt o be so close to the current! No kidding – wow Lisa, sure hope you are keeping a safe distance from the edge. Hope the rains and current don’t wreck too much damage to the riverside. Thank you so much, hope you have a wonderful weekend. Safe? How’s four or five hours away via car?! I’m based in the cloud forest until th e rainy season is over. I’ll be in Jama in a week’s time but stay at a friend’s hostal and just visit Casa Loca when there… Thanks, may your weekend go well! That’s right I forgot – your time in cloud forest has been very valuable for those folks. Have a safe trip back to Jama and best wishes for Casa Loca. Thank you so much Bo, I really appreciate it! What a beautiful drawing, Mary. I really miss seeing your work. Thank you so much Kerry, that means a lot – I hope you are well. I am doing fabulous! Better than I ever have. Thanks. Gorgeous piece, Mary. I agree, it’s the perfect writer’s retreat. Well done! As in your beautiful music Mihrank – really enjoyed your description and response. Thank you so much!! wow – thank you deeply! Thank you so much Rose Elaine!! Now I’m imagining Hemingway getting his inspiration.. Keep creating magic with your posts, Mary ❤ Happy weekend! Hi Christy, thanks very much!! Have a great weekend. Serene, yet spectacular, I’d like to sit a spell there! Thanks so much Resa – it’s a spot then with just your name on it!! Definitely a place that “quiets time.” Lovely Mary. Thanks so much Dorann – hope you have a lovely weekend! Hi Authority – thank you so much and glad you enjoyed the scene. Such a lovely painting Mary…wonderful artwork! Thank you Holly – I really appreciate it! Thank you for sharing this Mary! So serene. I feel relaxed just looking at this scene Mary. Thanks so much Susan – I’m so glad the drawing evoked that feeling, it’s what I was hoping for.